A Gippsland dairy farmer has purchased Silvan’s latest model paddock sprayer to meet his cattle’s pasturing needs. Silvan Australia says one of its newest model 3,000-litre capacity pasture sprayers sold to a large privately owned dairy farm near Barry Beach in South Gippsland. The sale together with the trade of the farmer’s previous Silvan 800-litre capacity trailed sprayer was negotiated by local dealer Andrew Dunkley Machinery at Yarram. Sales manager Daniel Leadoux says the purchaser farms about 280 hectares (or 700 acres) to milk about 450 cows and seeks to produce enough green feed off his own property to meet his needs. "A key feature of the Silvan pasture sprayer range is the many boom choices available up to 18m of ground cover along with electric control options that can be chosen to suit the application needs of a farmer or contractor," Leadoux says. Even four different axle and tyre options are available. A common feature, however is the base 2,500- or 3,000-litre capacity Polytuff impact resistant polyethylene spray tank complete with a calibrated fill sight line mounted on a fully galvanised chassis. The 100-litre capacity fresh water tank is mounted forward on the chassis for tank flushing or hand washing use for operator safety, and comes standard. "The basic pump offer is a PTO [power take-off] drive Silvan self-priming oil-backed diaphragm pump of 121 litres per minute capacity at 2,000 kPa pressure," Leadoux says. "However, three other pump options up to a hydraulic drive centrifugal pump of 400 litres per minute open flow at 7,000 kPa pressure to suit a tractor with the available hydraulic capacity." Four different control options include a five-section Silvamatic electric controller up to a Bravo automatic spray rate controller with each option enabling the sprayer operation to be commanded from the tractor cabin. The four track and wheel options range from a 2m width track axle with 24-inch (61cm) lug tyres up to an adjustable track option fitted with 44-inch (112cm) lug tyres. The intermediate choices also include a turf tyre choice and also a Simplicity axle fitted with 15-inch (38cm) lug tyres. Recognising every farm has different characteristics, the spray boom choices range from a 10m spray width Devil boom graduating upwards to 12m, 15m and 18m — the size chosen by the Barry Beach farmer. Booms including self-levelling, hydraulic lift and air bag suspension are options. Additional options available ex-factory from Silvan include two different foam markers, a chemical hopper, three- or five-section electric over hydraulic controls and two hose reel choices with hose length and nozzle choices to suit any proposed spot spraying application. As supplied by Andrew Dunkley Machinery, the pasture sprayer included hydraulic lift and a Silmix chemical hopper. "Our client also chose to have a GPS installed and Silvan undertook this prior to delivery," Leadoux says. Silvan Australia’s machinery specialist Chris Tait adds company’s long experience and leadership in spraying equipment and accessories confirms every proposed application is different. "Our farmer and contractor clients always want options to ‘spec their sprayer’ to their individual operational needs," he says. "Silvan believes by offering a strong feature based 2,500- or 3,000-litre capacity trailed spray tank it addresses the core requirement with the ability to add the operational and boom choices needed to address any infield requirements on-farm." 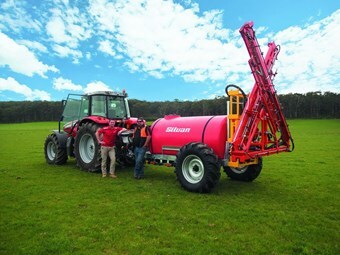 The base price for the 3,000-litre Silvan pasture sprayer ranges from $21,495 including GST. Find Silvan sprayers for sale. Look up Silvan sprayer specifications.